Robert Handley was born in Claypole c1889. He was brought up in Main St, Claypole but spent many of his teenage years in the Caythorpe area. 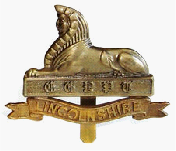 He joined 2nd Battalion, Lincolnshire Regiment at Lincoln and in 1911 he was at Victoria Barracks, Plymouth (as was his younger cousin William Handley). When the war broke in 1914 the battalion was ordered home from India. On arrival in England they were given 48 hours leave, which Robert spent with friends in Caythorpe. The battalion joined 8th Division, with other regular British Army units from around the empire. It moved to France in November 1914. Robert was killed in action in March 1915 during the Battle of Neuve Chapelle. This British offensive in Artois started on 10th March and he is assumed to have died on the first day. His body has never been identified and it wasn’t until late April that he was officially listed as dead. He is commemorated on Le Touret Memorial. He was 26 years old and was the first man from Caythorpe (or Claypole) to die in the war. A memorial service was held at Normanton.